Boaters are expected to maintain their berthed vessels, but some say enforcement is lax. Editor’s Note: This article has been updated since it’s original publication. A source directly associated with this story contacted the reporter with new information. LONG BEACH ― Slip holders are expected to care for their vessels to ensure their boats remain in decent condition. However, some boaters have complained about the condition of certain boats berthed at one Long Beach marina. The rules and regulations for the Long Beach marinas were updated in April, but are they being enforced? Some sources say they have not noticed the enforcement of rules. A reader who wished to remain anonymous contacted The Log about one particular boat in Alamitos Bay Marina being in poor condition. Alfredo Fernandez, communications director for Long Beach Marina Boat Owners Association’s (LBMBOA), said he had notified the Marine Bureau about that same boat when he, too, received a complaint. Fernandez also mentioned another boat, in the same marina, is possibly in worse shape. The sailboat remains at a slip in the marina despite appearing abandoned and growing algae. Ken Dixson, the owner of the sailboat pictured in this article, contacted The Log and admitted his boat was dirty, but said he planned to clean the vessel. Dickson added he preferred anyone who had an issue with the condition of his boat to approach him first, as opposed to complaining to marina staff or the city. Derelict or “unseaworthy” vessels violate Long Beach Municipal Codes 16.08.700 and 16.08.710. A vessel which is in a “state of deterioration” is considered to be one of the definitions of an “unseaworthy vessel,” according to the rules and regulations. “Any vessel determined to be unseaworthy shall be posted with a notice to repair or remove from the slip space. “If the Permittee fails or refuses to repair or remove the vessel within 30 days…the Manager may cancel the slip permit…and impound such vessel at the Permittee’s expense,” the marina rules continue. The Marine Bureau does issue warnings “when the boats start looking raggedy,” according to Fernandez. However, he said they do not enforce it. Fernandez has noticed the Marine Bureau taking swift action when slip holders are in violation of their rental agreement. “If the boat [owner] is late on payments, they get a notice. If they don’t pay within a two week period, then they impound the boat,” Fernandez relayed. Fernandez says he is aware of what goes on, since he is a liveaboard in Alamitos Bay Marina and has been with LBMBOA since 2002. Another board member of LBMBOA, Doug Dworski, has not observed any new action taken based on the amended rules. “I have noticed no change in the enforcement of the Marina Rules and Regulations since the revised rules went into effect,” Dworski wrote in an email to The Log. Dworski has a boat in the Shoreline Marina. He has not noticed any derelict boats in the downtown Long Beach marina. Dworski says he does think a minimum standard for vessel appearance is being enforced, especially as they rebuild the marinas. Boats get inspected to ensure they are in good condition and operable when they assume their new slips, according to Dworski. LBMBOA was involved in updating the marina rules and regulations and welcomed feedback from boaters, according to Tom Mayes, Ph.D., president of LBMBOA and member of the Marine Advisory Commission in Long Beach. The revised Long Beach Marina Rules and Regulations were adopted by the City Council on April 18. Boaters were notified about the updated regulations through a marina newsletter in August. “Notification to boaters about the approved changes was published in the August Marina Reader, the publication that is distributed to all slip holders in the Long Beach marinas,” Mayes confirmed. The updated marina rules and regulations for Long Beach can be viewed online at bit.ly/2xyf2TL. 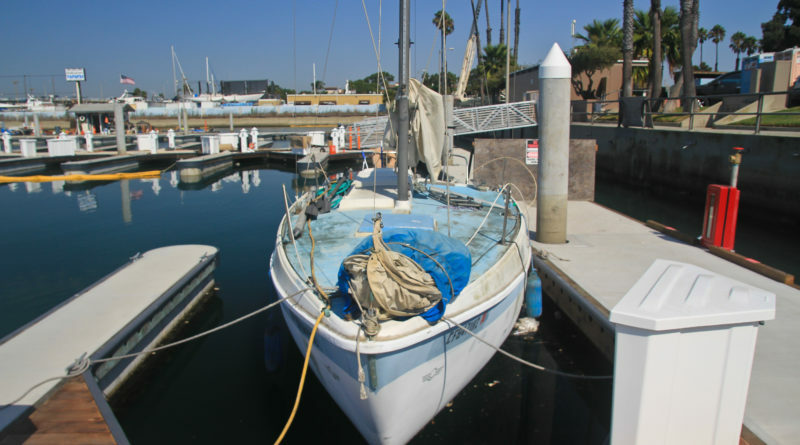 “Permittees shall maintain their vessels at an acceptable level of aesthetic condition, so not to detract from the overall slightly orderly condition of the marina,” the Long Beach Marina Rules and Regulations state. Mayes referred Elvira Hallinan, Marina Bureau Manager, and Kurt Borsting, Marina Operations Superintendent to reply to The Log’s inquiry about enforcement of vessel appearance standards. The Log reached out to both Hallinan and Borsting for comment. “Your inquiry should be directed to Elvira Hallinan, Marine Bureau Manager,” Borsting responded. The Log has not received a response from Hallinan by the time this issue went to press. A Marine Bureau customer comment and complaint form can be accessed online (bit.ly/2vKHQpP) to print, complete and mail postage free. However, Phil Hester is still stated as the Long Beach Parks, Recreation and Marine Director and Mark Sandoval as Marine Bureau Manager on this document. Both are no longer in those positions. Sandoval has not been the Marine Bureau Manager for the past three years. The current director of Long Beach Parks, Recreation and Marine is Marie Knight. The Marine Bureau Manager is Elvira Hallinan. Having outdated forms can cause confusion and frustration among slip holders. Who are boaters suppose to contact with questions or concerns? The Marine Bureau’s office number is 562-570-3215. The Marine Bureau Manager’s email address is elvira.hallinan@longbeach.gov. The Marine Bureau runs all three marinas: Alamitos Bay, Shoreline and Rainbow Harbor. Contact information for all three marinas and marina supervisors are also available online at http://bit.ly/2pgGKDD. Lack of enforcement of the rules for maintaining boats in slips (and moorings) is an ongoing problem in every marina I’ve been in. Many boats go for months—even years—without being used or maintained. They not only contribute to the visual degradation of the marina, but many become hazards due to insufficient or no proper bonding and/or shore-power cords. This can cause stray current to affect other boats and from what I’m told can contribute to their expense for more electrolysis prevention, and actual damage to their outdrives, etc.. A marina should be a place to come and sit on our boats and enjoy the view. Not to have to be subjected to a filthy, deteriorated boat next door. The marina operators should realize many people wanting to enjoy their boats are on waiting lists, and cause these irresponsible tenants to remove their boats. In my personal experience, dealing with the Long Beach Marine Bureau has been a total joke. We paid to be on their “waiting list” for a smaller slip for years. After several years of paying the >$50 “waiting list fee” (what nonsense is that? ), I finally told them to remove me when they called this year to complain that I hadn’t re-upped on the waiting list fee. This comes after years of assurances that the new construction in LB marinas would yield additional slips. Most recently I received a verbal “pat on the head” when I inquired as to my place on the waiting list and prospects for the future. I think I’ll save the money spent on the ridiculous “waiting list fee” and simply berth elsewhere, where my business is appreciated and I am treated respectfully. It seems that the LB Marine Bureau is run completely at the discretion of the director with very little in the way of recourse for those of us in the boating community who are not insiders. Pretty familiar-sounding if you have lived in, and voted in, Long Beach for any significant length of time. We have been very happy in our new marina in San Pedro. Good luck, LB slipholders! We once wished to be among that number, but no longer. Completely agree, they are some of the most ignorant and egotistical people I know. What a shame. Used to love this place as a kid and now it’s nothing but punks running the office joint. I vacated the Shoreline marina after several nasty incidents, i.e. ; After phoning the Harbor Police located close by, oneoftheir officers arrived and as fearing for my safety, I’d awaited the officer on shore at the head of my berthed vessel’s gangway. Once arrived I reiterated the reason for my call for assistance (abeligerant vessel owner who’d made threats and even used foul language both in the prescence of another same dock as mine’s slipholder. The officer accompanied me downthe gangway whereby I pointed out the offending slip and provided a descroption of that threatening slipholder as we approached that slip. The officer then directed to to continue onand go to my slip, and while I stated “Sure, no problem”, then as we both kept walking down the dock, nearing the problem slipholder’s slip, and while as dorected I advanced ahead of the officer whereby for absolutely no cause whatsoever, the officer shoved me from behind such that I nearly was pushed forward and about stumbled enough to have fallen flat on my face! He then stated I told you to go back to your boat. I later immediately contacted the officer’s superiors and was told thet it would belooked into. After about a wekk I re-contacted the officer’s superiors and was told that nobody else had complained about that officer and to just be thankful I wasn’t arrested. Unbelievable youmight say, but I was there and 24 years later I still recall it like it was yesterday. nearly the same service was yet again observed some months later when I’d awoken in the middle of the night, glanced out across the marina and noticed what appeared to be a man dressed all in black and carrying an apparently empty large black sack or bag (at soething like 3am in the morning). I watched for a moment as the ‘man’ disappeared from the mole road and as I didn’t see ‘him’ any further for several minutes, i phoned the harbor Patrol and informed them of what I was witnessing. I was told so why are you calling, I answered does that not sound suspicious for someone dressed as such, on foot and disappearing despite I could clearly tell if ‘he’ would’ve entered any of the gangways? I then was told we’ll check it out. Puzzled by the Patrol officer’s comments, I continued peering out from my boat and still then using my 50X binoculars for something like 30 minutes. And at no time was the Patrol’s vehicle, vessel or even anyone else on foot seen. Following those events, I vacated Shoreline Marina almost immediately.